We have way too much news for one day. So grab yourself a cuppa Joe and buckle in, because it’s going to be a bumpy ride. Just one year for the hit-and-run death of a Laguna Beach bicyclist. Twenty-one-year old Dylan Thomas Rand-Luby plead guilty Monday to one count of felony hit-and-run with injury and one count of misdemeanor vehicular manslaughter without gross negligence in the death of John Colvin over two years ago. Sure, you could call death an injury. Rand-Luby swerved his car out of his lane and into the bike lane where Colvin was riding, striking him from behind, then continued on for another mile with a windshield too shattered to see through before finally pulling over. He had faced up to four years in prison, but accepted a plea deal calling for just one year behind bars, with three years formal probation upon his release. You can read the OC District Attorney’s full press release here, including the very moving impact statements from Colvin’s family. Thanks to Edward M. Rubinstein for the heads-up. The LA Times released security camera video of the beating of South LA bike rider Clinton Alford, Jr. by an LAPD officer following a brief chase on bike and foot. Yet despite what you see, the LA District Attorney’s office inexplicably let the officer who kicked Alford in the head, beat him for several seconds, then kneeled heavily on his back for a couple minutes — even though Alford was in handcuffs and laying face down on the street the whole time — off with community service and a $500 fine. And he could have his felony conviction changed to a misdemeanor once he completes the terms of his plea deal. 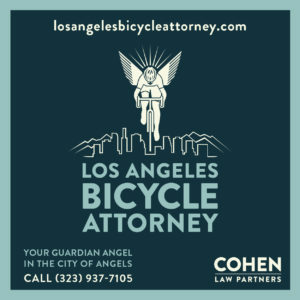 This is the third time DA Jackie Lacey has let a cop off with a slap on the wrist — or less — in a case involving a bike rider, following her refusal to charge the sheriff’s deputy who killed Milt Olin, and the three Gardena cops who fatally shot the unarmed brother of a bike theft victim. Clearly, the DA has someone’s back. The online bike world blew up over the weekend when not one, not two, but three sportswriters felt a need to display their ignorance, anti-bike bias or just plan willingness to risk the lives and safety of those on two wheels. Starting with a tweet from Sports Illustrated’s Peter King showing his co-worker driving in the bike lane in order to get to San Diego’s Qualcomm Stadium for an interview. A move that did not sit well with a number of people, including the San Diego Police Department. Properly chastised, King apologized on Monday. Although generally, if someone is truly repentant, they don’t bury the apology at the bottom on an exceptionally long column. Then there’s Nick Canepa of the San Diego Union-Tribune, who felt compelled to chime in, saying it’s hard not to drive in a bike lane down there since it’s all they have, claiming there’s 10,000 miles of bike lanes for just ten bicyclists. Never mind that San Diego ranks third nationally for bike commuting among cities over one million population. This is what San Diegan Frank Lehnerz had to say in an email to Canepa’s colleagues at the U-T.
No, it’s not okay to violate CVC 21209 as Mr. King bragged on social media last weekend. There are plenty of normal traffic lanes for motorists to use. Bike lanes are far from “all we have.” Nearly every mile of freeway in the city prohibits cyclists and the infrastructure is only usable to only the most competent and attentive cyclists. If your colleague can’t learn, respect, and follow the laws, he should do the public a favor and surrender his driving license. In addition to the few dangerous drivers, bicyclists here in San Diego have to deal with potholes, train tracks, cracks, non-functioning signals, and bikes lanes which end all the sudden at intersections and where roads cross over freeways. Personally I’ve dealt with several close calls of people driving motor vehicle swerving into the bike lane in order to pass stopped traffic or get a head start on making a right hand turn. These drivers often do this with no turn signal or with a cell phone in hand. 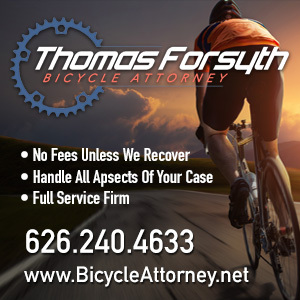 It’s not a joke when a cyclist is struck and injured or killed. In some cases it’s a hit and run, in others the cyclists is either dead or unable to recall the actions and thus his or her side of the story is never told. Motorists should not be in the bicycle lanes unless it’s for one of the exemptions given under CVC 21209 and after they’ve ensured the lane is clear of cyclists. And last, and certainly least, there’s former footballer and current NFL Network analyst Heath Evans, who may have absorbed one hit too many before hanging up the cleats. Because it was Evans who took it a step further by expressing his desire to run down people on bikes, apparently because he was briefly delayed by a couple cyclists in Venice. Funny how no one ever says they want to kill motorists because they were stuck on the 405 for hours, but a few seconds behind someone on a bike is enough to bring out murderous rage. 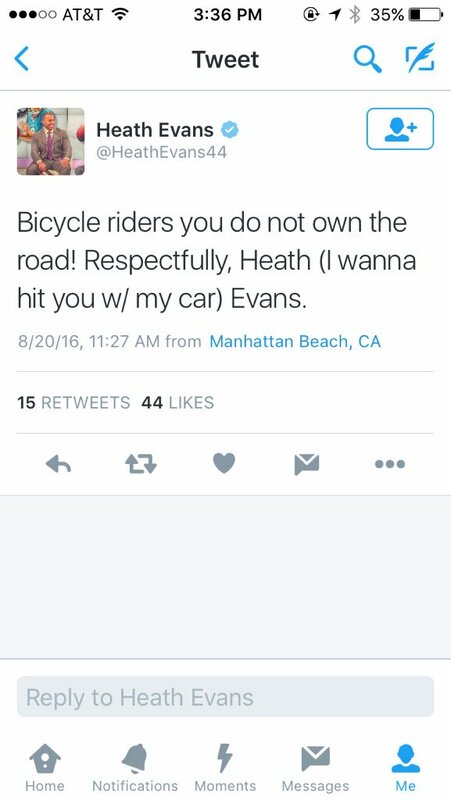 Like King, but apparently, not Canepa, Evans apologized after debating the matter with rightfully enraged members of the Twitterati, even as he expressed bewilderment that bikes don’t actually belong on the sidewalk. It’s worth a few minutes out of your day to read what Cycling in the South Bay’s Seth Davidson has to say on the subject. And even New York’s famed Bike Snob couldn’t resist adding his two cents to the West Coast blow-up. Because, as ignorant as these comments and actions were, these are the people we share the streets with. And as much as we might like to think they’re extreme examples, the attitudes they express are a lot more common than any of us would like to believe. Thanks to Cuong T. for the tip. 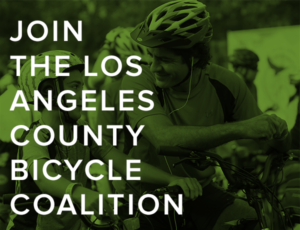 Good luck to Mark Friis, formerly the Executive Director of the Inland Empire Bicycle Alliance. Friis recently stepped down from his position, and yesterday the reason became clear. He’s about to embark on an around-the-world bike tour. You can follow his journey on his new website. And contribute to his efforts online, if you’re so inclined. Pomona police dig into their own pockets replace the bike a 12-year old boy was rebuilding after it was stolen; it only took 20 minutes for eight cops to step up after the call went out looking for officers willing to pitch in. Clovis police recovered a boy’s stolen bicycle after it had been dismantled, so they rebuilt it themselves before returning it to him. Bighearted volunteers in Calgary are refurbishing donated bicycles to provide reliable transportation for Syrian refugees. CiclaValley takes a late night ride with Walk Bike Burbank’s Midnight Ramble. Pasadena is taking steps to become more bike friendly in the next 10 to 15 years — apparently not five as the headline suggests — by conducting road diets and installing buffered and protected bike lanes. Damien Newton’s latest podcast talks with Claremont Mayor Sam Pedroza and Jose Jimenez, Education Director for Bike SGV. Cyclelicious says thank you, but he did not coin the term Idaho Stop, although he was among the first to popularize it. San Diego’s CicloSDias open streets event returns on October 30th after a two year hiatus. Meanwhile, San Diego’s City Heights neighborhood will get a new bike co-op, including a weekly bike valet. The San Diego Union-Tribune looks at the state of protected bike lanes in the US, and around the world. 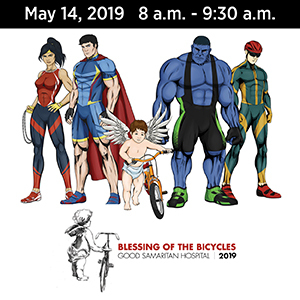 Sunday marks the ninth annual Bike the Bay in San Diego, offering riders a once-a-year opportunity to ride across the arching San Diego – Coronado Bridge. Although you’ll find yourself among the bizarrely anti-bike Coronado denizens once you get to the other side. A law firm is offering a $25,000 reward for information in the hit-and-run death of Moreno Valley resident Duane Darling as he rode his bike in Mead Valley last month. The Redlands cycling community mourns Randy Stephenson, who was killed by a driver fleeing sheriff’s deputies in Loma Linda last week; the long-time member of the Redlands Water Bottle Transit Co bike club had just left Don’s Bike Shop in Redlands when he was run down. The Bike League looks at how cycling can help solve global warming. A Chicago website reports on the booming, spandex-free underground bike scene that roams the city every Monday night. Eleven cities in the US and Canada are now using the sonar system developed by the Chattanooga Police Department to measure whether drivers give bicyclists the three-foot passing distance required by law. Sadly, Los Angeles isn’t one of them. The New Yorker looks at the challenges of transforming the Motor City into a bike making center. A Rochester NY minister is offering a $1,000 reward for his stunt BMX bicycle that apparently fell off his car on the way back to his church — after using it to jump over a helicopter into a burning wall. New York needs a better system for removing abandoned bicycles clogging up the city’s bike parking. Tragic irony, as a Florida man who served time for killing a man in a road rage incident was himself the victim of a road raging driver. Bike Radar says the formula for how many bikes you need is N+1 = CX, offering five reasons why your next bike should be a cross bike. New cars should be able to see you by 2018, even if their drivers don’t. A Columbian startup is rewarding riders in Bogotá and Mexico City with points for each kilometer they ride, which can be exchanged for discounts at participating merchants; they will expand into Vancouver next. A Toronto sportswriter tries riding the new Rio bikeways without luck, including the rebuilt cliff-side trail that collapsed earlier this year, killing two people. Winnipeg bike riders are advised to use two locks when they lock up, as bike thefts jump nearly 75%. A Brit bike rider claims to have set a new world record for the longest distance traveled on a bikeshare bike in a single hour, at just over 20 miles. A British woman wants signs posted in a park warning pedestrians about bikes after she was knocked down by a bike rider. Seriously, anytime there are pedestrians around, slow the hell down. Apparently not satisfied with winning most of the cycling medals in the Rio Olympics, British Cycling looks to build on its success. Everything you need to know about getting back on your bike after a vasectomy. No, those aren’t bike shorts. And if you’re going to use an axe to try to hack through a bike lock in broad daylight, try not to whack the bike. One important thing that would save lives would be to link cars GPS to speed limits and the cars speed sensors. Then drivers couldn’t speed.